Today we printed VeryWetPaint's Rattleback Twins model from Thingiverse. If you spin one of these "rattleback tops" in the proper direction, it will actually shake and reverse itself, ultimately spinning in the opposite direction! It is really weird. Settings: MakerWare .3mm/low with the usual 10% infill. We also made a set with a much higher infill but they actually worked less well than the 10% infill models. Stuff to change: Some sanding was required to get the rattlebacks to function correctly. Next time I would print at a finer resolution and also try to print the models on their long edges, in the hopes that the tops would be smoother. 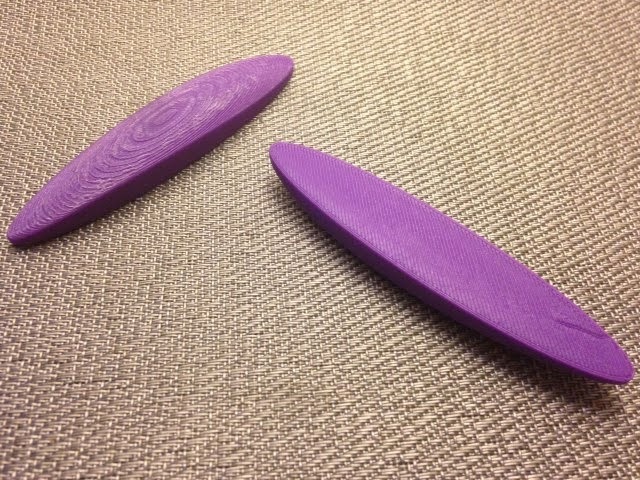 These do reverse direction but do not spin very much after reversing, and I think further sanding or finer/smoother resolution would improve the action.